As I stood in line with approximately 7 bagillion of my fellow Americans on Election Day, I was feeling super uneasy. I found a friend in the crowd, and we mulled over the current status of our country and the Church. I was “getting out to vote” for the first time in a while (please don’t tell Joel’s aunt, the election commissioner!). I felt like I needed to explain my lack of initiative to the registration lady who handed me the sticker I felt unworthy to wear. Even though (cringe), I knew whom I was voting for, I completely panicked the minute I realized I had to vote for local candidates too. It hadn’t even crossed my mind to research local issues. It was November’s version of the recurring dream where you oversleep for the exam, and you look down and have no clothes on. I checked a few boxes for people I knew and left the rest empty— on matters I am SURE will weigh heavily for my future grandchildren. My face was getting really hot so I quickly clicked VOTE, turned to leave and then immediately BURST into tears. I was sad for my country and that these were the only viable options for President. I felt guilty and irresponsible for not doing more to make a difference. Inflated view of self much? I could not for the life of me control my tears. Heavy, hot ones kept coming as I exited the polling place and walked down the middle of two really long lines of people waiting to vote. A coworker saw me, and with wide-eyes asked, “Kitty, are you okay?” All I could get out over my snorting and snotting was that I was really sad for my country. I’m semi-laughing at the scene as I rehearse it in my mind now. I got in my car, still caught off guard by my seemingly ridiculous tears, and tried to remember the last time I had cried. I couldn’t remember. Maybe sometime back in the Summer? I tucked the episode away to think about during carpool or maybe after the kids were in bed that night. There were a few more episodes of unexplainable and randomly-explosive tears. It felt bizarre really. I know it’s wise to listen to my tears. I regularly tell college girls, “Our emotions are like the emergency lights on the dashboard of your car, signaling it’s time to CHECK UNDER THE HOOD to see what’s really going on.” I just hadn’t done that for myself in a while. It’s easy to help others and accidentally ignore your own soul. Isn’t it? My tears told me that God was quietly breaking through into my reality. I left no space to process these tears, so my soul grew disconnected and distant. For a few months, I lost touch with my inner world. There was the ever-shortening fuse with my kids. The fantasy of getting the flu so I could opt out of life and sleep for a few days. There was the lack of desire to read my Bible. There were the impulsive Amazon purchases rooted in hopes that maybe reading ONE.MORE.BOOK would be the answer to my physical exhaustion and internal frustration. There were disappointments with friends and ministry. After the final blow of a challenging disappointment, I felt stuck and traumatized enough to shoot an email to a favorite spiritual director/counselor friend begging her to meet me for lunch when we would be traveling through her area. She graciously said yes. I made bullet-point lists in my journal of things that were draining me and the rotten fruit that I could see hanging on the limbs of my life. I asked Joel and close friends what they saw in me that was “off”, and I climbed into her Forerunner to head to lunch. She wouldn’t let me ask all my favorite, “What’s going on with you?” type questions. All she said was, “Okay, so you seem depleted, maybe even dangerously tired.” Her simple presence made me feel safe and known enough to shut up and start talking all at once. Her gentle questions and long, holy listening opened honest spaces in my heart. It was over lunch with a friend and the best turkey melt and marinated cucumbers I’ve ever tasted that I started to feel my soul fully connected for the first time in several months. I told her I have been overly responsible for wearing other people’s emotions. I confessed that the jobs of mothering and ministering felt all-consuming. My ideals were crushing and my to-do lists had grown to be unreasonably long. I told her I felt like every day I emptied my tank and it was never enough. She prayerfully listened and committed to the process of seeing this ball of yarn continue to unravel. These are things that have served me well through this season. These are the practices that have connected me again to my soul. It’s required me to rework and rethink my commitments, goals and ideals, remembering that my Savior is not a task-master, but a gentle and kind Shepherd. It’s meant claiming my identity as a loved daughter and a sojourner here in the world. In my 20’s I cared what others thought of me. In my 30’s I have subconsciously focused more on what I think of me. But connecting deeply with Jesus means caring primarily about what He thinks of me and that was made clear on the cross. My inbox, smartphone and laundry pile do not rule me. Nor does the plentiful harvest of ministry. I am a citizen of Heaven. My Father is the King and I live for His approval, not my own. Thank you Jesus for emotions that help us realize what’s going on in our soul because in the hustle of life, it’s all too easy to be driven by fear rather than led by love. Guys, I started this post when it was 77 degrees outside and it’s currently 30. 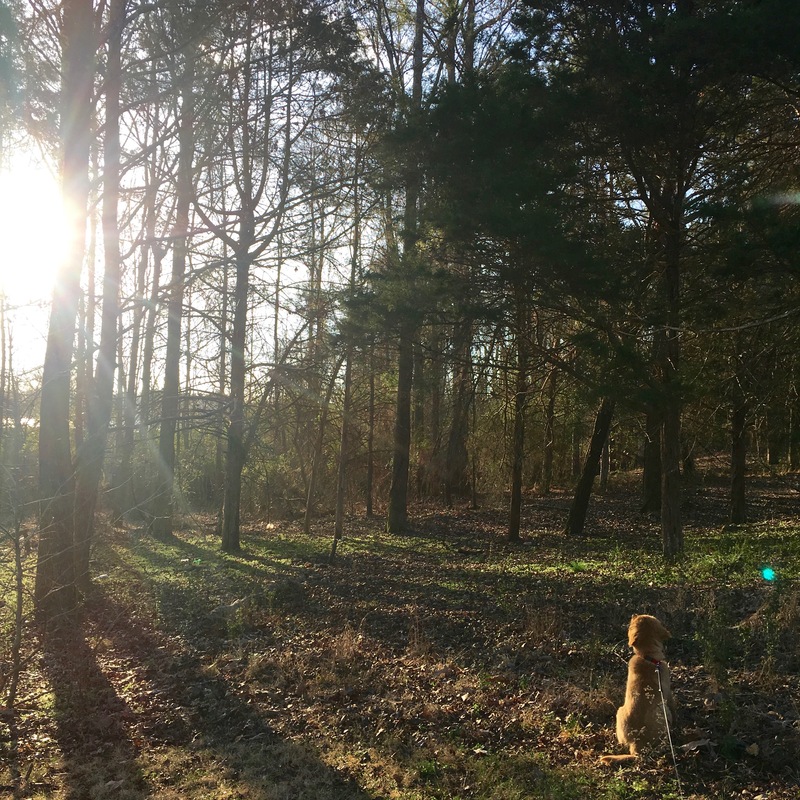 Writing a “What I’m Learning: Winter” post felt a little weird in shorts, but when one of your favorite writers inspires you with a quarterly series of observing and learning from your dailiness, you ignore The Weather Channel and go with it. Then, a week later, you snuggle up with your computer and your favorite quilt because it’s a perfectly cozy day to hit “publish”. The practice of paying attention to what we’re learning serves as an anchor for the soul in a fast-moving world. Instead of waiting for the world to stop so we can catch up, we slow ourselves, look around, and name what we see. 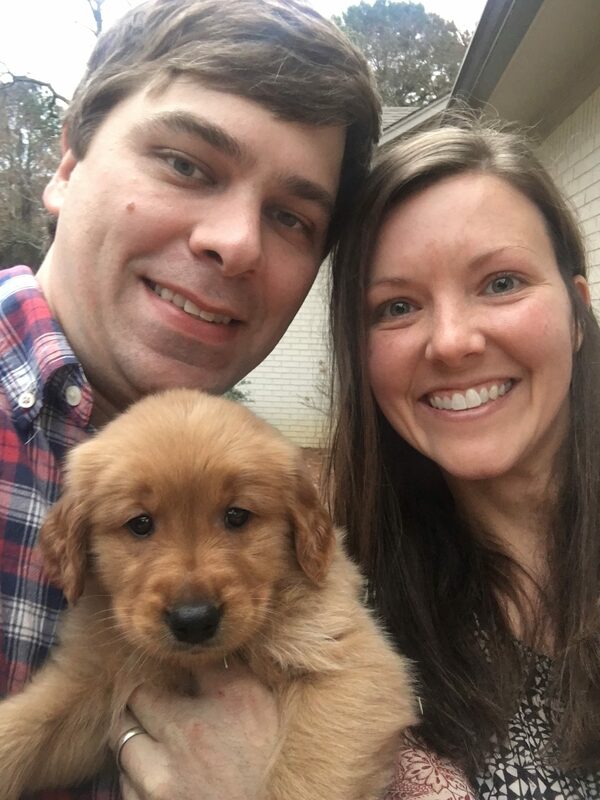 So, we are now proud pet owners of ONE “adowable” dog. 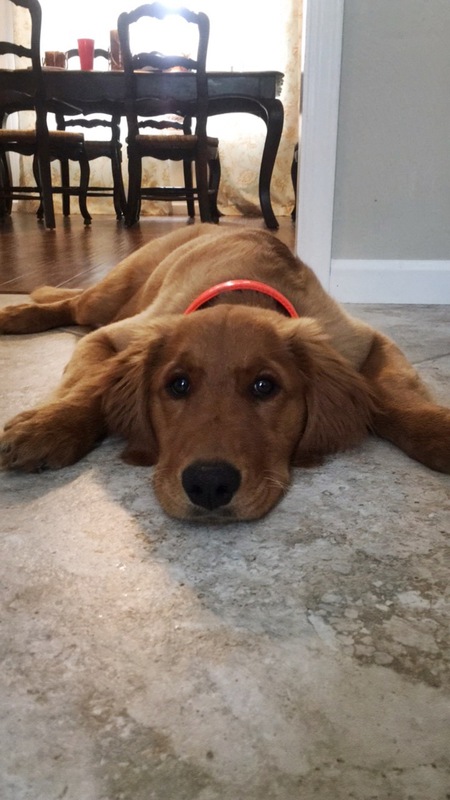 Ya’ll this dog has brought an insane amount of joy to our family. So much laughter and so many parenting illustrations for the kids about how it feels when someone doesn’t obey you. Summation: we are smitten and he is the sweetest dog you’ve ever met. He’s already huge. Speaking of huge…My kids are getting huge. I know all parents are shocked by their kids’ growth and development, but I am gonna play the adoption card and say that adopting two kids after those big birth-3 milestones makes you see the golden years in a new light. Keeping the Sabbath day holy has been a game changer for my mental and emotional health. I’ve read books on Sabbath rest since I graduated college but never actually KEPT the Sabbath consistently. In her book “Rhythms of Rest”, Shelly Miller calls to mind the way we fill the pantry and hunker down for a big snow storm when a winter weather watch is in effect and in the same way she encouraged me to think about what preparations I could make to ensure the greatest amount of Sabbath freedom. I know it’s coming! I can look forward to it because if the work week is the inhale, Sabbath is meant to be the exhale! This Winter I’ve been doing things like prepping meals ahead of time, sharing expectations with family members, signing off of social media, etc. This “snow day” mentality has been something that’s made me be more intentional the rest of the week and also less gripey about my need for me time/rest/quiet/etc. because at least 2-3 out of 4 Sundays I know it’s coming. Another thing that’s help has been keeping a cumulative list of the restorative things I’ve done on those Sabbath days. It’s really fun to see a growing list of adventures taken, books read, loaves of bread made and friends with whom I’ve connected. I highly recommend Sabbath list keeping. 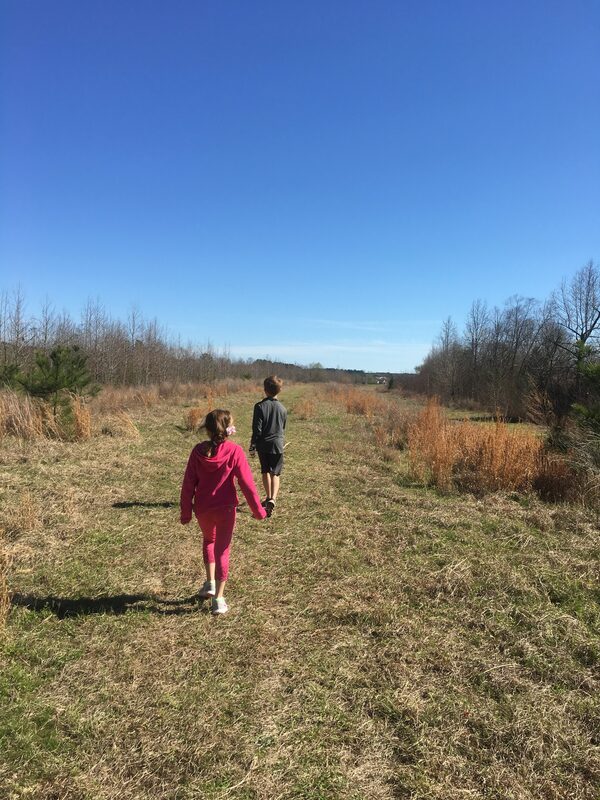 We’ve made it through hybrid homeschooling and we don’t completely hate our lives. I’m gonna chalk that up as a win. I shared about this on Instagram Stories, (it’s like Snapchat for old people), but I am continually realizing how entitled I am to my time and how even regarding people and things that help me fulfill my calling, sometimes I’d rather just hide. Much to my frustration, I am learning how much I struggle with anger and fear in my heart. It comes out through my mouth in the way I respond to and micromanage my kids and the way I overshare with friends…I think this comes from a place of wanting to be seen and heard and known and understood (all things only God alone can truly offer me) and you just can’t always have that desire met by humans. Golden retrievers though? Vaults. The Lord has been showing me that I may not suffer much as an American Christian, but sacrificing this desire for the greater reward of being seen and know by Him is worth it. The Chronological Read Through the Bible Plan on the Holy Bible App. Oh my heavens. My alarm goes off, I roll over and grab for my phone, with one quick click I am in business to start the day with the Bible in chronological order! I think 60 women from my church are doing this and sometimes we chat on a FB group about it, but holy moly I LOVE this reading plan. On days I am in a rush, I just pipe it in on the audio version and HELLO IT’S MARCH AND I AM STILL ON THE WAGON! THIS NEVER HAPPENS. For as long as I’ve had an iPhone I’ve thought, “How can we send men to the moon and not think to extend charging cords so they actually reach from your plug to the top of the nightstand? I do not have hotel lamps with plugs built into them, people!” But, hey, when Apple forgets your service appointment and offers you a free product you do not take the screen protector they offer you, but rather suggest a free cord that will reach far enough for you to stir the boiling water and talk on the phone at the same time because, let’s be real, everyone’s phone is dead by dinnertime, amIright? Learning about the Enneagram. Mind Blown. I’ve started using a bullet journal. 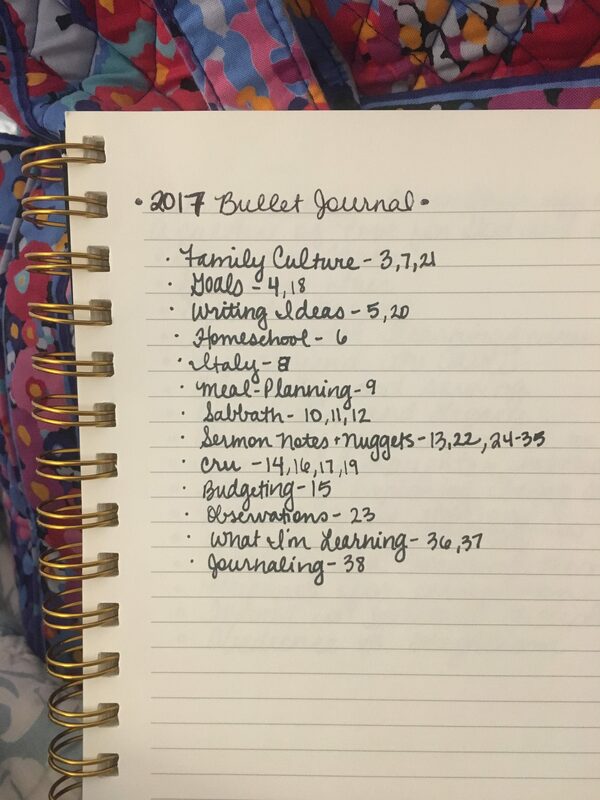 Basically a great notebook from Marshalls + brain dumping everything from to-do lists to sermon notes and adding a table of contents = life-changing Bullet Journal. One word…a TILE! I have gone from losing my keys and phone 17 times a day to not. I cannot describe my husband and co-worker’s relief. If only I’d had a Tile affixed to my bullet journal. I added up the number of hours I spend carpooling my kids…and I should not have. BUT it made me realize Voxer (group voicemail), Spotify (streaming music-here’s a playlist I made for a recent women’s retreat) and podcasts are saving my life. A few of you have asked what I’m listening to, so I’ve listed and linked my favorite podcasts here for you: The Art of Simple, The Road Back to You, Upside-down Podcast, Read Aloud Revival, God-Centered Mom, One Extraordinary Marriage, Lead Stories, The Gospel Coalition, The Accidental Creative, HopeWriters, The Portfolio Life. Tears and anger are the biggest indicators of my heart these days. I meant to already have published a post about this, but it’s still in the draft file. Anything making you teary and/or angry lately? (#homeschooling) I feel like I’m on the brink of tears or internal temper tantrums more often these days…it’s telling. Also, when I start to feel shakey on the inside and I can sneak out to carpool 10 minutes early I like to go sit in the cemetery across from my kids school. Morbid? Nope. Melancholic? Perhaps. There’s something incredibly grounding about just sitting in the solitude of God’s presence, staring at the beautiful broken reality of life. The book of James…it’s the oldest book in the New Testament. Who knew? Okay, probably you, but not me. I’m leading a discipleship group that’s studying James this semester and it makes so much more sense to understand that it was one of the earliest books written in the New Testament…so of course God went to all lengths to give the baby Christian church a “how-to” guide for living amidst persecution! James uses OT language while having the most references to Jesus than other books in the New Testament…where have I been? I can fill up a cloud like nobody’s business and Apple’s Customer Service rivals Disney. I spent 5 hours at the Apple store last month and walked away with a new iPhone, free charging cord, a tuned up computer and having had 5 hours of journaling/semi-alone/people-watching time. WINNING. I’m trying to read one book/month that is outside my usual Christian non-fiction realm. This month I am reading “To Keep the Waters Troubled” because I always pass the “Home of Ida B. Wells” on the way to my in-laws in Holly Springs, MS and figured it was time for me to learn about this woman worthy of sign on the highway. WOW. Woman deserves more than a sign I will tell you that. 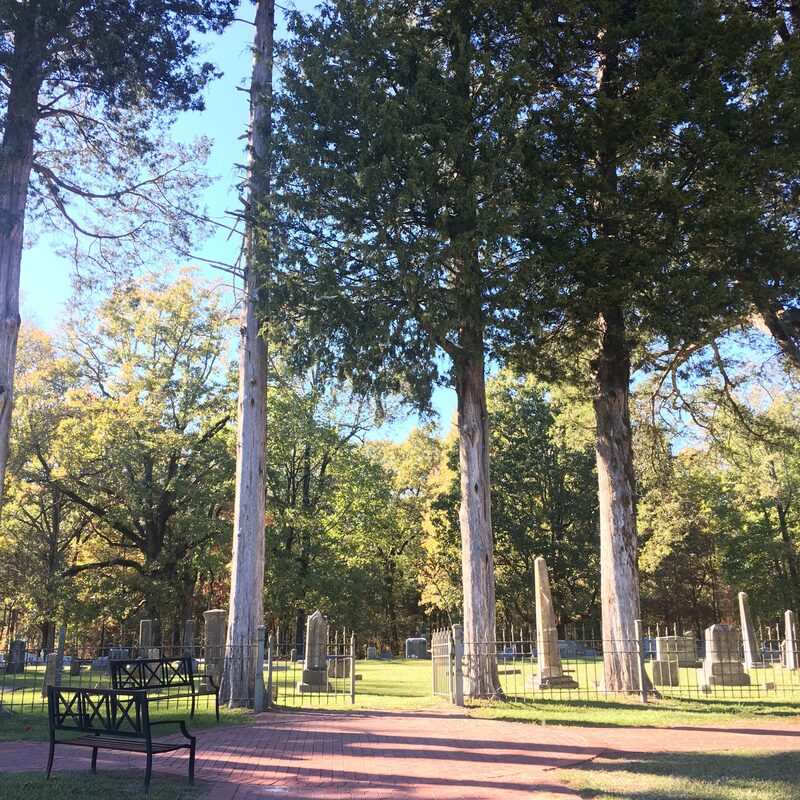 I’ve learned so much about Holly Springs and was going on and on to Joel about how Yellow Fever wiped out the majority of the town in the 1878, to which he replied, “Right, there’s a graveyard out where we go hunting for a lot of the folks who died then.” WHAAATTT?! Summation: learning about the people and places that make your current state what it is happens to be very fascinating. At 35 I can finally say that I am bad at TV and movies and pop culture in general and would rather read a book or troll Instagram. There, I said it. It’s all spiritual on some level, isn’t it? I think I’ve mostly been learning what it looks like to love. Sometimes it looks like speaking hard-to-hear truth in love and other times it looks like love graciously covering a multitude of sins. 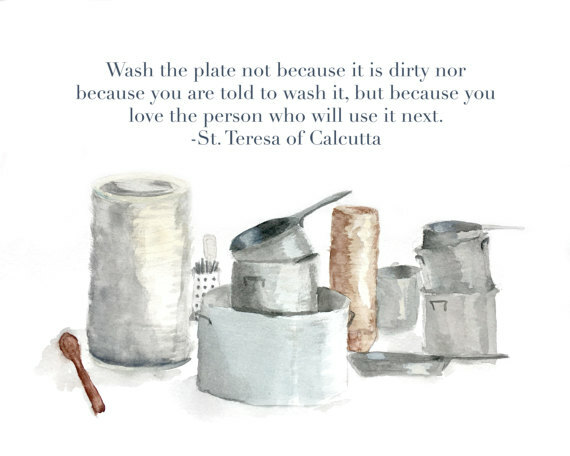 Today, it looks like doing the dishes and the laundry to the glory of God and for the love of people, not to win the approval of men or because I enjoy it. Join us on our wild adventure of following Him & loving them!